2+ monsters Once while face-up on the field (Quick Effect): You can target monsters on the field and/or GY up to the number of monsters co-linked to this card; return them to the hand. If a monster this card points to is destroyed by battle or sent to the GY: You can Special Summon 1 monster from your hand. Firewall Dragon is the top of the top Link Monsters. This is the face of Link Monsters, and for very good reasons. 2+ monsters to make this, but so easy to do so. Two Link 2 monsters or just play Scapegoat, once it gets on the field, the possibilities can be endless. The subject of countless combos of Special Summoning loops and bouncing involving Grinder Golem, Firewall is nuts. You could potentially bounce four monsters back to the hand with this card (if co-linked on all four points). If you flip Firewall face-down, it will get to use that bounce once more. The ability to Special Summon a monster every time a monster it points to gets destroyed or sent to the grave is the absurd effect that makes Firewall the best. You can keep replenishing the field with monsters to be destroyed as long as you have a hand with a monster. Clearing the field ability, spam the field ability, easily summoned, no limit on the spam effect, and good stats backing it, there’s no question why Firewall Dragon is the best Link Monster out there. Merry Christmas and/or Happy Monday! 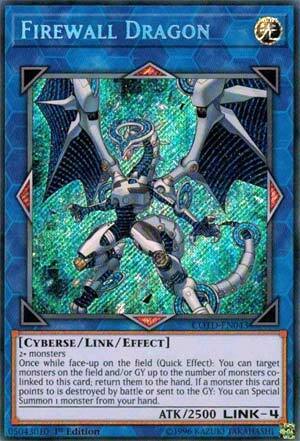 Firewall Dragon is a bouncy Light Cyberse-type Link 4 Monster with 2500 Atk. So in addition to being a beater it gets to bounce monsters up to the number of co linked monsters. This ability can be used to extend combos (Grinder Golem) or just offensively to attack directly. The second effect contributes to some potentially bad had advantage, but it’s better to have options than not to. Ideally, you’d want a high level monster to Special Summon from your hand. I like that the condition to Special Summon can activate more than oncer per turn and during either turn. Technically, it isn’t a cost, but a monster co linked to Firewall Dragon does need to hit the grave for it to activate. Like Cyber Dragon Infinity and Toadally Awesome, Firewall Dragon is a great opening move to make the opponent have to think about getting rid of this first before making any big plays. Plus, it being a generic Link Summon makes it extremely versatile which is always good. Merry Christmas! We now remind you of a card that only helps generate degenerate loops, the number 5 card of this Top 10, Code of the Duelist’s cover card, Firewall Dragon. Firewall Dragon is a Light Cyberse that is a Link-4 with 2500 ATK. This is the protagonist’s ace, so 2500 was standard. Link-4 isn’t hard, especially since Firewall only needs 2+ monsters, Cyberse doesn’t have too much great stuff to it yet, and Light is one of the better attributes in the game. The arrows are Up, Down, Left, and Right. Once, while Firewall is on the field, you can bounce monsters on the field or in the GY to the hand up to the number of co-links this card is in. Oh, you can smell the loops already. Self bouncing has generated FTKs for years and this card was no different. It is great for getting back resources or outing the opponents board as well if you aren’t going for the FTKs. This card also lets you summon a monster from your hand when a monster this guy points to is destroyed by battle or sent to the GY, and this isn’t even a once per turn, so you can keep using this effect to really help you generate a powerful board. The most absurd Link Monster currently in the TCG and has already been limited in the OCG on the January 2018 list, which should be followed up in the TCG very soon (first protagonist ace to get hit on the list). The card is very poorly designed and that makes it an outstanding Link Monster.